Raise your hand if you are addicted to milk tea. Yes, I see you. And you, and you. For those of you who haven’t tried it yet, I’m not sure if you should: It’s very habit-forming, and can be pretty expensive to go out and buy. When I was ten, I remember a D.A.R.E. officer telling us that some people were so addicted to cigarettes that they would would smoke a pack a day, and at $3.50/pack, that came out to over a thousand dollars a year! My jaw dropped. A THOUSAND BUCKS TO KILL YOURSELF?! Well, my boba-loving friends, sometimes I wonder if we’re in the same boat. Instead of cigarettes, it’s milk tea… and instead of cancer, it’s diabetes or obesity or something. But the $3.50 price tag sounds about right, and I’m willing to bet there are some of you who, if you really thought about it, guzzle down this frothy liquid almost daily. Some of you even get it twice in a day sometimes:once after lunch, and again that evening when a friend texts to see if you’re free. Oh… well… for the sake of hanging out. Yes, yes. I suppose I will have to just get another one… *giddy laughter inside*. How did I know about that? Yes, it’s me too. This is how I came to realize that I was addicted to milk tea. Now, addressing the addiction is probably the heart of the matter, but I’m not ready for that yet, so until then, I will merely search for a way to minimize the cost of it: MAKE IT YOSELF! I’ve tried, JoEllen, I’ve tried! It’s just not the same. It doesn’t taste as good. Yes, I hear you. I, too, have been trying for the last 15 years to nail down the perfect milk tea recipe myself, to little avail. As the options of milk tea shops keep expanding, so my milk tea taste buds keep getting refined. I have never been able to make a satisfying cup of milk tea to adequately stave off the next milk tea run… until now. My faithful mommy group has come through for me once again. 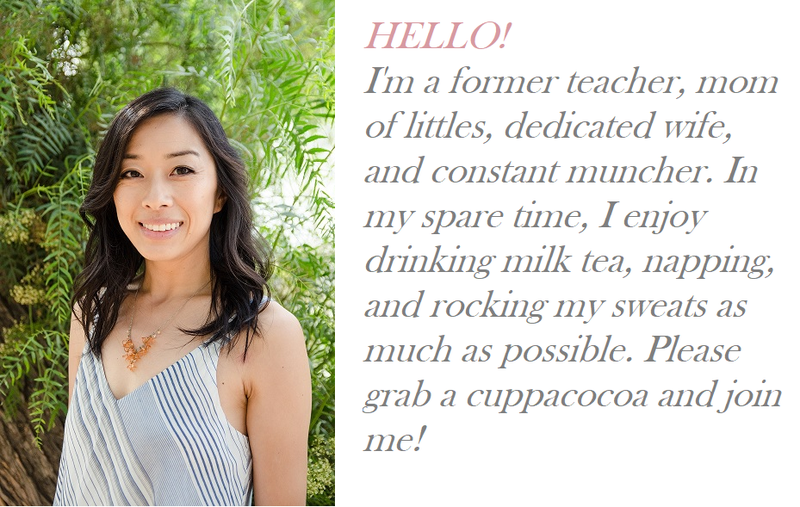 What does milk tea have to do with mommy-ing, you ask? Um… Milk tea = happy mom. Happy mom = happy family…? If you’re not up for a six-minute video, you can jump straight to the recipe below. I’ve tried three versions: Lipton decaffeinated tea, Earl Grey tea, and the Red Rose Tea that was recommended in the video. The Red Rose Tea turned out the best and was definitely satisfactory in quenching my milk tea thirst! I’ve tried it with various combinations of brown and cane sugar, and couldn’t really tell the difference, so I think you’re okay either way on that. Also, I like to chill my sweetened tea before mixing it with the creamer and ice– it gets less watery that way. 11/18/15 Update: For green milk tea, I plan to try out Possmei Jasmine Green Tea , which I saw the workers at Tous Le Jour mixing up. Will post a recipe after I try it! Shake it with ice and creamer, and you’re done! 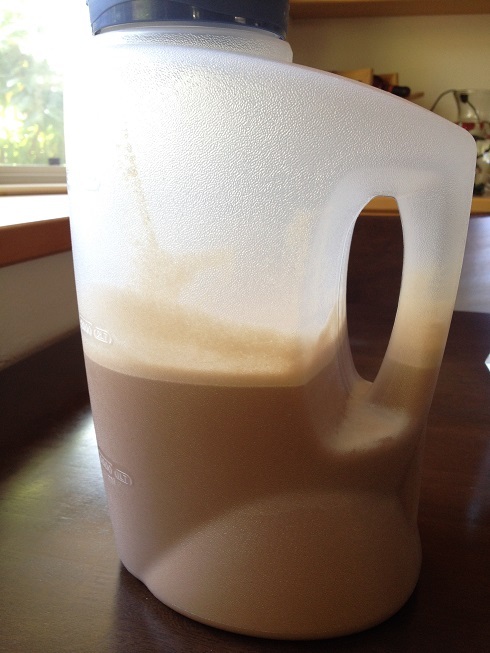 That worked out pretty well, but a couple days ago, I made another big batch and decided to just just whir everything together in a Vitamix and served it out of a pitcher. It was just as good (and a lot less work). Several of my friends with highly discriminating milk tea palettes gave me the “It’s legit!” on this round of taste tests, so it is now post-worthy. Here you go. Be sure to use 8 ounces of water per serving to steep your tea– this is not the time to stretch your dollar (or cents). Watery milk tea is not nearly as satisfying! I’ll really have to control myself so my body doesn’t suffer from this dangerous recipe discovery– I’m pretty sure I consume enough sugar as it is! I, for one, am content to end my milk tea recipe search here. Perhaps now you can, too! Steep tea bags in 8 oz. hot water for ~5 minutes. 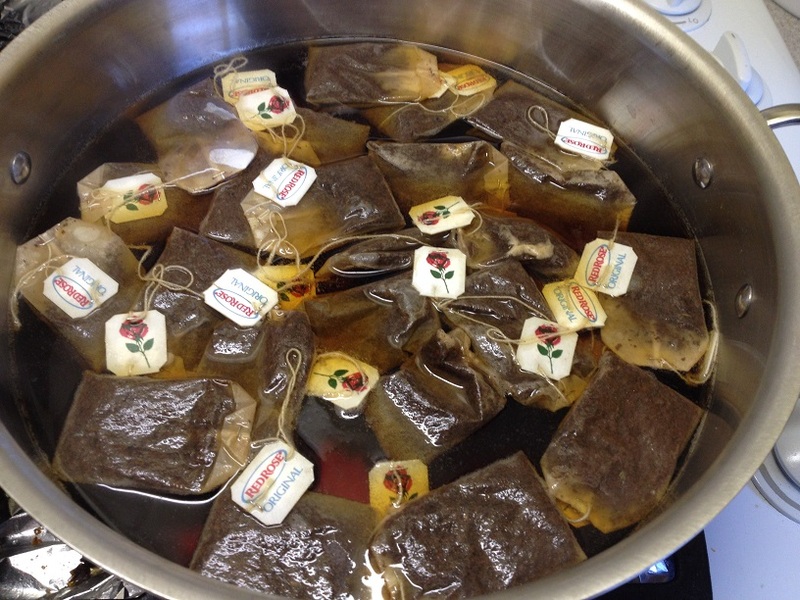 Remove tea bags and add cane sugar. Stir until completely dissolved. 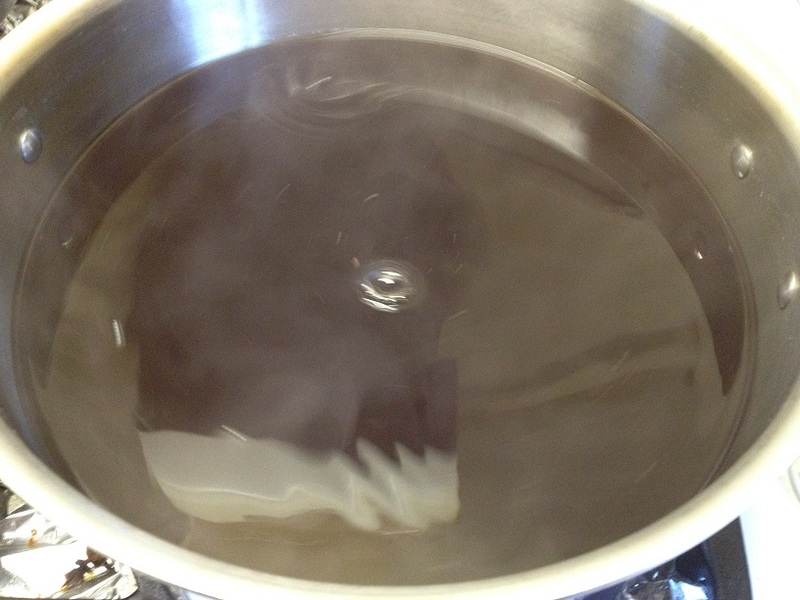 Edit 11/18/15: After steeping for 5 minutes, stir, and then let steep for 5 more minutes. This gives more tea flavor, which I like. 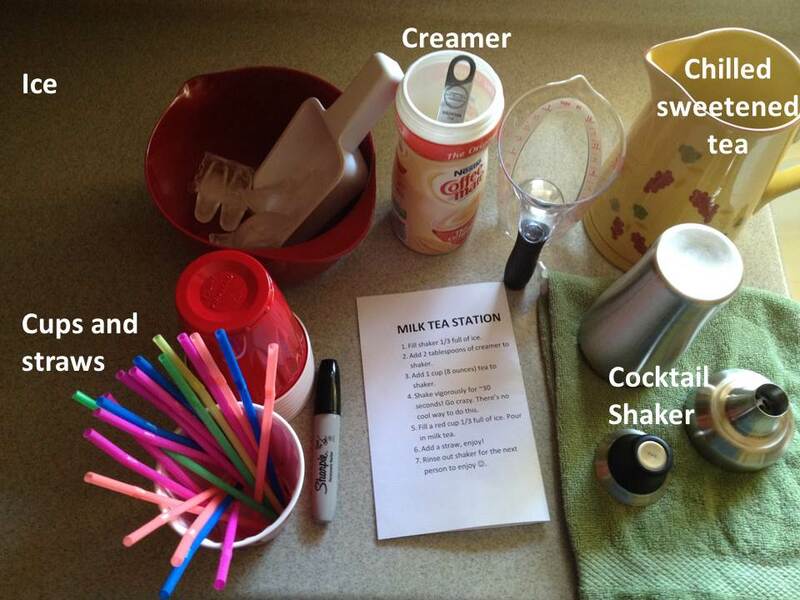 Fill a cocktail shaker with 1/2 cup ice and creamer. Pour tea into shaker and shake until outside of shaker is cold. Before sealing the lid onto your shaker, you might want to stir the liquid about in the ice a bit first to cool down the tea. Pour into glass and enjoy with a straw! Steep tea bags in 8 oz. hot water for ~5 minutes. Remove tea bags and add cane sugar. Stir until completely dissolved. Chill sweetened tea in refrigerator until cold. 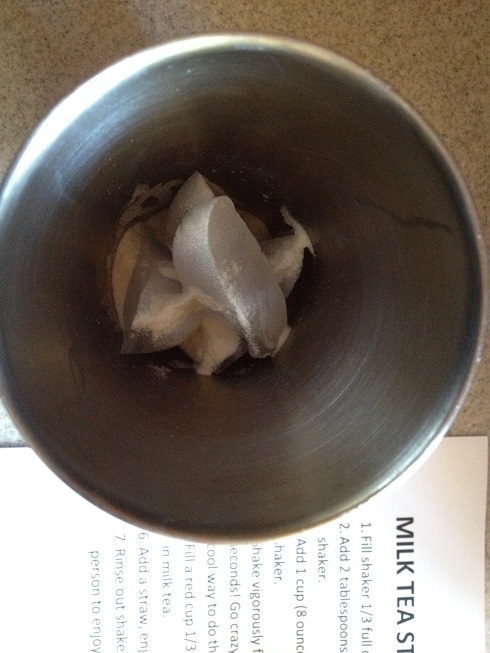 Fill a cocktail shaker with 2 cubes of ice and creamer. Pour tea into shaker and shake until outside of shaker is cold. Pour into glass and enjoy with a straw! 3/3/2016 Edit: I just tried making Mango Milk Tea by using Mango Ceylon tea bags instead- SO GOOD! Hi. 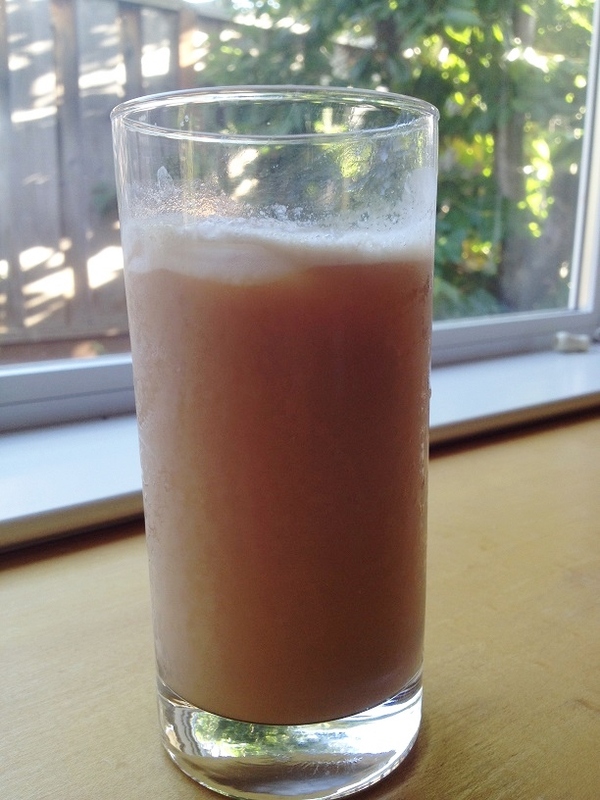 I tried this recipe and it was the best milk tea I have ever made by myself. It tasted just like you said. Authentic Taiwan milk tea. Thanks! QUESTION: I want to make a big batch. But I can’t find a big jug like the one you have in the picture. Where can I get something like this? Woohoo! Glad you liked it! Here’s a similar jug: http://tinyurl.com/kx4q8wx You can use keywords like Rubbermaid or Sterilite “pitcher with lid” to see other options. Thx! When making one serving 8 oz. Hot water I follow the directions but after shaking with ice the tea serving is more like 14-16oz. So when making a lot at once would I add more hot water than usual? since I will not be mixing the hot tea with ice but instead will mix all ingredients and then refrigerate it. Otherwise the tea may be sweeter than when I make just for me. To make a lot at once, I chill the sweetened tea in the refrigerator. Once it’s chilled, I whir it in a blender with the creamer, and then serve as-is. I don’t bother with ice. This results in a much stronger tea flavor. As you said, it’s also sweeter, so if you’d like, you can add water to taste and blend! Well I was so surprised to hear about milk tea . Then only to realize that my great great gramma was making it for me my whole life . So cool . And I make it for my children often . 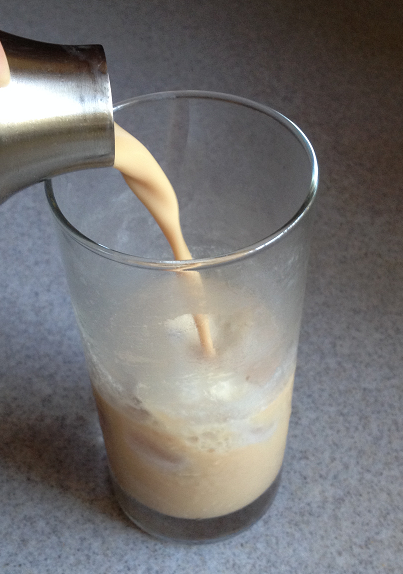 I even go as far as I make some of it in to ice cubes so I don’t get watery milk tea . We love it . And yes it’s w lot of sugar . I make it for a treat and if they have a bad day I cheer them up with Nanna s milk tea . I can’t wait to try the pudding . I tried making it just now, and it came out really yummy! I made it with green tea bags, and it came out tasting better than some green milk tea I’ve had at boba shops (which is kind of sad now that I think about it since it was my first try making it….). Sweet! (har har… pun intended… :)). I haven’t tried it with green tea bags, but I’ve been meaning to. Maybe I will try today! Thanks for the reminder :]. Yeah, it’s a lottt of sugar, isn’t it? =P Too bad! Thanks for the recipe! I’m going to use it again soon. hi there, came across ur site when looking for mango pudding, and it was a HIT when i made it for a gathering!! everyone in the party kept asking for more!! thks soooo much!! juz wanna ask u, u said u’ve used vitamix to do the mixing for this milk tea, so i was wondering did you add ice while u mix? TIA! Hooray! I love to hear when people have tried recipes and enjoyed it!! As for the milk tea, I just use the blender to whirl it all together without ice, and then chill it in the refrigerator until it’s time to serve. This is the best way to have the most tea flavor come through, instead of a watered-down milk tea (which happens when you add ice). If you’d like you can serve it over ice to have it extra cold. If you’re making a lot, this process is a lot easier than shaking several cups worth with a cocktail shaker! Sweet! Would love to hear how it turns out! so glad i stumbled upon this! like you, i’m addicted to milk tea but it adds up when i want one every day! i grew up in a predominantly asian area where milk tea shops are a galore so i’m really picky about how my milk tea tastes. i’ve tried replicating the drink at home but of course it just doesn’t taste the same! i’m going to order the the tea bags and try this recipe. I will most likely post it here if I ever find a great milk tea version. I can’t promise to remember to email you, so your best bet is to check back now and then (or subscribe? :)).